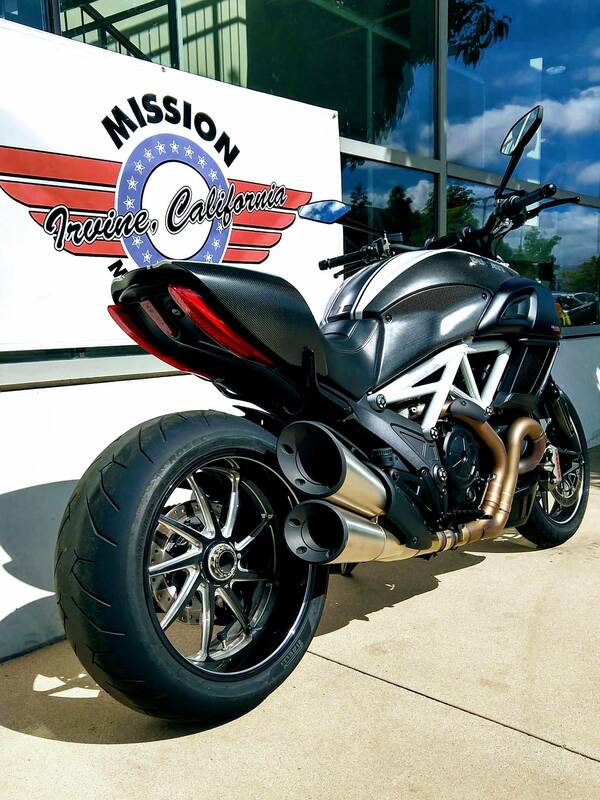 "Don't call me a cruiser" The Diavel Carbon exemplifies the distinctive style and sporty soul of the Diavel with high-quality, light-weight components. Clad with carbon fiber and Marchesini forged wheels, weight is reduced to just 205 kg, only further enhancing the performance of this extraordinary motorcycle.The intoxicating design, with innovative LED headlight, and refined rider comfort of the new Diavel may imply "cruiser," but the brute force of its 162 hp Testastretta engine and its razor sharp handling prove otherwise. Marzocchi forks with low-friction fork legs: The Diavel uses 50 mm Marzocchi front forks with fork legs finished in low-friction diamond-like carbon (DLC). These forks are fully adjustable for spring pre-load, compression and rebound damping. The forks are equipped with slash-cut triple-clamps - the bottom yoke in die-cast aluminium and the upper in forged aluminium - with a rubber-mounted tapered alloy handlebar clamp. With a 28° steering rake, 130 mm trail and 24 mm offset, this set-up provides a sure-footed yet agile front end for incredible handling. 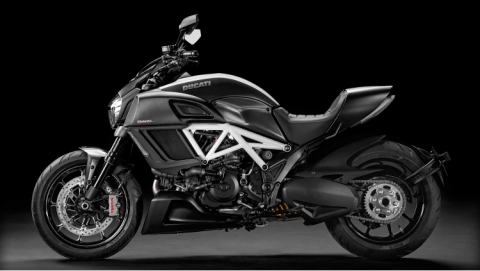 Diavel frame assembly: The signature Ducati Trellis frame uses large diameter, thin wall tubing with two lateral die-cast aluminium sections that flow into the rear subframe. This achieves massive torsional rigidity while remaining lightweight and compact. The two sections form a rear-end structure by attaching onto either side of a complex techno-polymer component. Testrastretta 11°: The Diavel's heart is the Ducati Testastretta 11° Dual Spark (DS) - developed directly from the incredibly powerful, world-beating race engines of Ducati Corse. Ducati's Testastretta 11° DS harnesses the immense power of the Superbike engine and makes it smoother and more linear, combining high performance with an enjoyable and perfectly manageable ride.To create an engine with this blend of brute power and supreme usability, Ducati carefully developed its cam timing with a particular focus on the valve overlap angle. 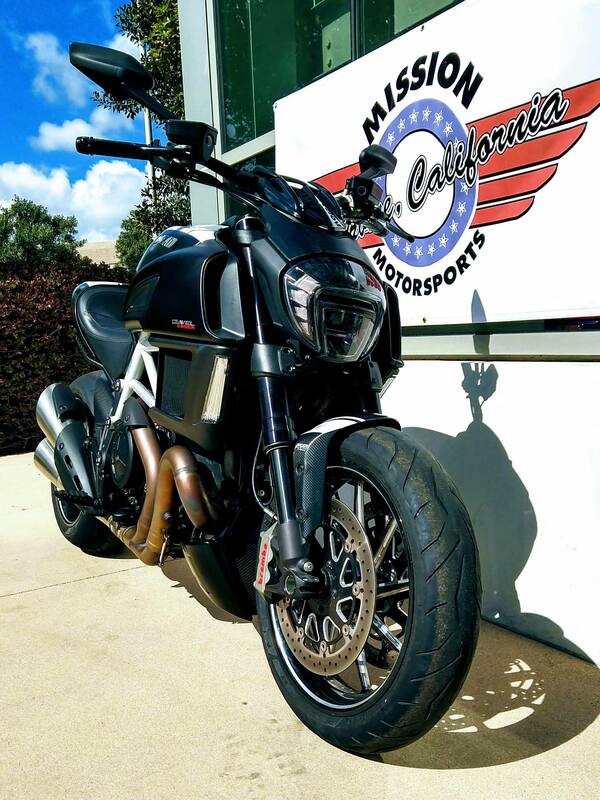 Defined as the period of crankshaft rotation (in degrees) during which both intake and exhaust valves are open at the same time, this overlap angle is set at 11° on the Diavel's engine - much less than the 41° used by Ducati's Superbike engines. As a result the fresh inlet charge is less compromised by exiting exhaust gases, resulting in smoother combustion, improved fuel economy, and lower exhaust emissions. Along these same lines, the Testastretta 11° DS employs several other technological advances. Targeted injectors direct their charge to the intake valves, which provides better vaporization of the air/fuel mixture. This compressed intake charge is ignited by twin spark plugs in each chamber for rapid and even combustion. And after exiting the combustion chamber, a secondary air system burns off any residual fuel molecules, allowing a richer mixture to be used without increasing emissions. 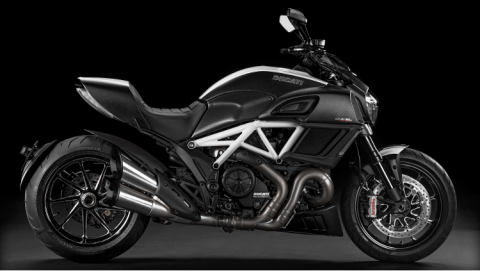 As a combined result of these technologies the Testastretta 11° DS is the perfect base for the Diavel - full of character, and producing tremendous power that give unmatched acceleration, along with smooth and controllable delivery for cruising the boulevard at any speed. 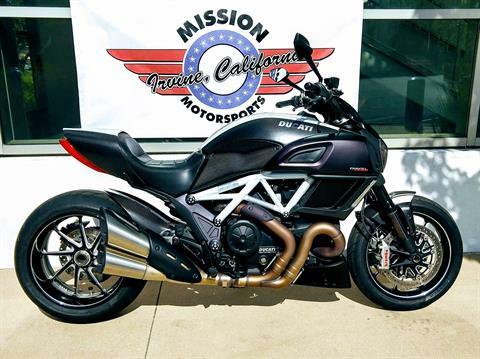 Exhaust system: The massive 58mm (2.28in) section exhaust headers lead the 2-1-2 system through power-enhancing equal length pipes that enable the Diavel's efficient power delivery. The engine management system dedicates a lambda probe to each header, providing precise fueling via a large airbox, while the new slash-cut vertically stacked exhaust silencers carry catalytic converters to provide Euro 3 conformity and feature an electronically controlled mid-section valve to optimise exhaust pressures throughout the rev-range. Power and Torque: With its 162hp and colossal 96lb-ft of torque, the Diavel Testastretta 11° DS engine defines authentic Ducati Desmodromic performance. Thanks to dual spark plugs, high-compression pistons, and revised injection spray targeting, the engine's torque curve is strong and smooth at low rpm, and remains so through a wide rev-range. The engine output is managed by Ducati's Ride-by-Wire (RbW) system to ensure effortless ridability, with plenty of power on tap also for high-rpm riding. Split-level instrumentatio: The upper LCD display is mounted on the handlebar riser and provides key information such as speed and rpm, in addition to showing warning lights, time and temperature. The lower, full colour Thin Film Transistor (TFT) unit is integrated into the fuel tank and provides an incredibly clear display of the currently selected Riding Mode, gear, and DTC level as well as total and trip mileage. Used extensively on mobile phones and computers, TFT technology is superior to LCD and displays easy-to-read high resolution graphics. 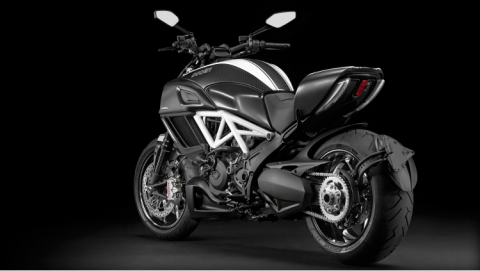 The Diavel's TFT display goes one step further by sensing the ambient light conditions to automatically select a black or white background colour. When the Diavel is stationary, its lower display also doubles as a user-friendly control panel to personalise and save DTC and RbW settings within each Riding Mode - creating a custom electronics configuration to suit any rider's preference. Seat: The Diavel Carbon features a dedicated seat, comfortable and beautifully shaped to fit the flowing lines of the machine, that includes a sleek and easily removable carbon fibre cover for the passenger portion. Marchesini nine-spoke wheels: The Diavel Carbon has lightweight forged, machine-finished wheels by Marchesini that not only achieve an impressive total weight savings of 5.5lb (2.5kg) vs. the standard Diavel wheels, but also look spectacular. These highly intricate nine-spoke wheels feature machined details in natural aluminium, set against a black finish. 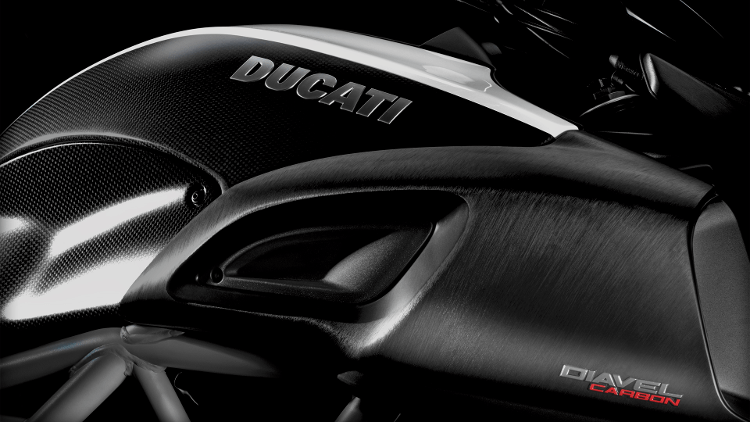 Carbon fiber: Carbon fibre is used for the tank panels, passenger seat cover and front mudguard to reduce weight and reveal the racing heritage that runs deep in Ducati's DNA. Customise your sensations: Assert your character and shape your Diavel to express the real essence of your personality each time you take to the road. Reinforce the bold, unconventional looks of your motorcycle with design features and technological components grouped into three tailored packages to add flavour to your style. Choose the pack which reflects your character and answers your needs: Sport, Touring or Urban. Sport pack: Muscle up into an expression of roadworthy power with a selection of components ready to add a touch of class and design to your Diavel. Special materials and exclusive styling will enhance the sporting looks of your motorcycle. The package includes a carbon rear mudguard, an instrument cover and headlamp cover kit also both in carbon fibre, as well as billet aluminium brake and clutch fluid reservoir caps and a rear brake fluid reservoir cover. Touring pack: Enjoy the convenience of specially designed accessories to accompany you on longer distance trips. 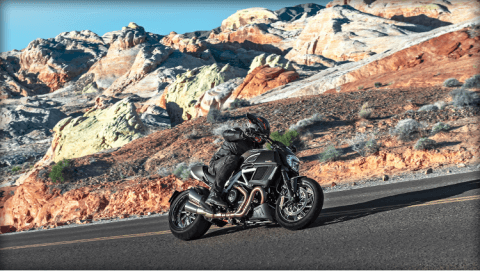 Built to provide the best in terms of comfort and ergonomics, the items included will transform your Diavel into the ideal touring motorcycle making each trip another milestone along the road to riding pleasure. The package contains a set of side panniers for ample storage, a back rest kit for added comfort and a specially designed Plexiglas windshield. Urban pack: Rule the town with a dedicated range of stylish features for the modern urban environment. Cutting-edge design and beautifully finished accessories will cast a classy light across the downtown scenario, both day and night, each enhancing the sleek lines of your Diavel. The package includes lightweight forged aluminium rims, racing billet aluminium footpegs, a carbon fuel tank protector and the following billet aluminium components: a kit of frame plugs, front sprocket casing and clutch casing cover. Front wheelLightweight alloy, 14-spoke with machined finish 3.50" x 17"
Rear wheelLightweight alloy, 14-spoke with machined finish, 8.00" x 17"
Rear suspension: Fully adjustable rear shock with progressive linkage. Remote spring preload adjustment. Single-sided aluminium swingarm.